On Thursday, 4 September, the new president of the Musée d’Orsay, Guy Cogeval presented his policies for the next four years to the press. He has obviously not been idle since being appointed as he has set out a full agenda which promises to change the look of the museum profoundly. We had already spoken here of the different wall colours tested in two of the rooms (see news item of 2/7/08). The changes were approved by Gae Aulenti, the architect who had remodelled the train station when the museum was created and who was expected, mistakenly, to reject the changes. The lighting will also be entirely redone, with indirect neon lights eliminated as these flatten the colours and prevent, as pointed out by Guy Cogeval, a full appreciation of the nuances and shades. The organization of the collections will also be entirely modified with work carried out progressively so as not to disrupt visitors. The first stage has started in the Chauchard gallery, on the side of the Seine river, at the ground floor, between the exhibition rooms and the central hall (ill. 1). Guy Cogeval noticed that the public does not stop here and uses the gallery as a connecting hallway to go to the Courbet room to admire The Workshop and The Burial at Ornans. He hopes that the addition of colour and the improved lighting will turn it into a real exhibition space where art lovers will spend more time. If this succeeds, there would be plans to present notably Millet’s The Angelus and The Winnowers here. The Lille gallery, located symmetrically opposite on the other side of the central hall, will be remodelled in late 2008 and will house the Second Empire collection leading logically to the Carpeaux sculptures. Some spots will reopen for the public, for instance the former “lobby” of the hotel (at the northwest corner of the museum), which had been closed for several years. In late 2008 it will hold an exhibition of decorative arts of the IIIe République in keeping with the décor of the period thus displaying a large portion of the collection donated by Philippe Meyer, a leading patron at Orsay and also the Musée Granet who passed away recently . In the pavilion at the back where architectural mockups, built for the museum’s inauguration, were shown until recently, work will start in January 2010, adding at least 500m2 exhibition space on three levels, that is a total of 1,500m2. The ground floor now welcomes large historical paintings against a mauve background (see news item of 5/7/08). On the first floor visitors will be able to enjoy large Symbolist and Nabis décors, including one by Maurice Denis for the chapel at Le Vesinet which had never hung in the museum. Guy Cogeval would like these rooms to encourage an interactive dialogue with sculptures, art objects, decorative drawings and large paintings. Decorative arts from foreign schools (Rennie MacIntosh, the Viennese, etc.) which had remained invisible for so long will be presented on the upper floors, highly justified as those who attended the museum’s inauguration twenty years ago will recall their stunning effect. 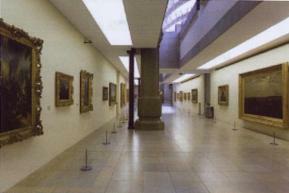 The Impressionist galleries, on the last floor of the museum, will also undergo a major change, starting in 2010 or 2011. Here again, the lighting will be redone. The Moreau-Nélaton collection might be placed at the beginning of the visit and Manet’s Déjeuner sur l’herbe at the center of this new presentation. The column galleries (ill. 2), which today house the Pont-Aven school and the pointillists, were already too narrow in 1986, with spaces which were too dark and tight for Gauguin and Seurat. They will be reserved for temporary exhibitions, while the entire post-Impressionist collection up to 1900 will go down to the intermediate level next to the Bourdelle and Maillol sculptures already there. Thus painting from Gauguin to the Nabis will be assembled on one floor and the construction of a staircase will allow visitors to reach the pavilion at the back which we already saw will be devoted to large décors. All of these developments will be accompanied by a remodelling of the upper level coffee shop, much too small, which will expand thanks to the adjoining rooms currently exhibiting pastels (and which we hope will be displayed elsewhere). The Campana brothers have submitted a decorating project for the café inspired by an Art Nouveau theme. Rather than creating an annex like the Louvre or Beaubourg, Guy Cogeval, who emphasizes that the collection is not sufficiently extensive to do so any way, suggests strengthening ties with provincial museums. He has thus created a “19th century club” grouping establishments of European size with collections corresponding to that at Orsay (Rouen, Marseille, Lillet, etc.). The meetings (the first one has already taken place) will be held twice a year. This cooperation will result in joint exhibitions, more important loans from the Musée d’Orsay (this will be the case for Van Gogh-Monticelli in Marseille and the exhibition of Nordic paintings organized at the Musée des Beaux-Arts in Lille). The policy of deposits in provincial museums already applied by Serge Lemoine , will be continued. Cooperation with foreign establishments will also be developed. Without going into detail, Guy Cogeval also stated that the American Art Museum in Giverny from which the Terra Foundation wishes to partially withdraw, might welcome two exhibitions a year in collaboration with Orsay. Finally, the public establishment owns (like the Louvre with the Musée Delacroix), two annexes in Paris. The first, the Musée de l’Orangerie, will be officially joined to the Musée d’Orsay early next year and Emmanuel Bréon, who until now was in charge of the Musée des Années 30 in Boulogne-Billancourt, has just been appointed as its director. As for the second, the Musée Hébert, closed to the public for too long, Guy Cogeval continues to reflect on its future. He is not willing to accept — a move which we firmly support — the current state of affairs, as suggested by some which would mean the permanent closing of the establishment. All of the measures outlined above are indeed promising. Nevertheless, we regret that due to budget demands as well as the need to finance these projects, Orsay is still forced to pursue — although of course in a less pronounced manner  — the policy of paying exhibitions which has tended to develop discreetly, but still quite steadily over the past few years. Let us hope that these at least represent true scholarly projects. In concluding, we would like to add a word about upcoming exhibitions. The program is remarkably well-balanced as it offers studies of both so-called “academic” artists such as Jean-Léon Gérôme (fall 2010) or Ernest Hébert (with his Italian peasant women, in 2009) and the Impressionists (a major Claude Monet retrospective end of 2010 or 2011, introduced by an international colloquium end of 2009 ; Renoir and his late paintings in fall 2009 at the Grand Palais, a project initiated by the LACMA). Symbolism will be the subject of an exhibition entrusted to Michel Draguet, to take place in 2011 at the same time as one on Odilon Redon at the Grand Palais. Foreign artists will not be overlooked either, among them James Ensor (fall 2009), the great Finnish painter Gallen-Kallela (2010-2011) and — but the project has not yet been confirmed — Giovanni Segantini, nor will sculpture with Rodin’s posterity studied under the beautiful title Oublier Rodin (Forgetting Rodin) and an exhibition on the theme of Masques, architecture (a Labrouste retrospective, probably in fall 2010 with the MOMA and an exhibition of uncompleted projects for Paris), photography and decorative arts (presentation of two china sets by Bracquemond and Lambert). As we know, Guy Cogeval likes wide-ranging multi-disciplinary exhibitions which allow a comparison of different artistic expressions. Thus, he is planning one on Louis II of Bavaria in 2012 and Vers le cinema (Towards Movies) the same year, a fascinating subject which will study notably the links between this incipient art form and historical painting. Contemporary art presentations — a vogue in ancient art museums which continues to grow — will also occur, but less so, favouring rather a scattering of one artist’s works throughout the permanent collections. These announcements are very promising and reflect a coherent vision for the museum. We will however withhold our approval on one point : Guy Cogeval stated that he preferred, a matter of personal taste, to display fewer works on the walls and “dramatize” these more. However, it would be advisable-even if the public finds it at times more difficult — to favour a tight hang rather than put some works back in storage. A “spacious”, that is minimalist, presentation is alas, a popular trend in museums today. This can be justified in the case of Impressionist or avant-garde paintings, clearly less so for academic painting which, in the Salons, always hung “cheek by jowl”. No doubt, there is room for compromise between the two positions. On the other hand, we enthusiastically welcome his idea of mixing painters at times, as opposed to always following traditional categories, as shown in the example of the new and very successful hang of the 19th century galleries at the Metropolitan Museum. The idea of presenting the works from the Philippe Meyer collection in this location was first suggested by Serge Lemoine, the former President. For example in Montpellier and Angers to mark the reopening of these museums. Guy Cogeval did in fact cancel two exhibitions of this type, one in China and the other in Macao when he arrived.